The Video Games Live concert tour kicks their merchandising up a notch with this new VGL-branded VIVO MP3 player, loaded with unreleased recordings from Kingdom Hearts, Halo, and more. 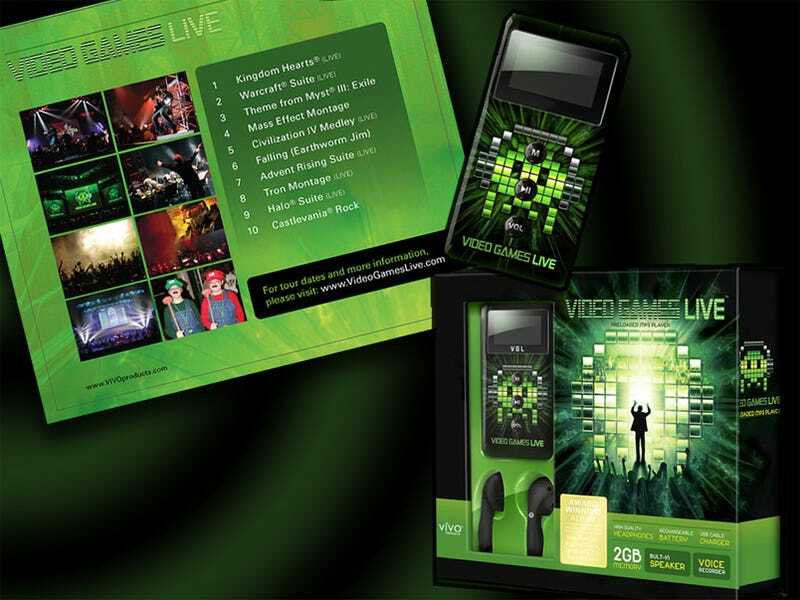 The 2GB MP3 player is now available for sale at the Video Games Live online store, and will also be making appearances at the merchandising tables at Video Game Live concert events and eventually retail outlets. It a pretty standard player, though the VGL design on it is rather snazzy. The main selling point will be the 10 tracks of previously unreleased live recordings, with Halo, Kingdom Hearts, Warcraft, Castlevania, Myst, Mass Effect, Civilization IV, Tron, Earthworm Jim and Advent Rising tunes available exclusively on the device. Enticing, but is it $50 worth of enticing? This probably would have been a very attractive deal a few years ago, but now that everything I own plays MP3s, I'm not seeing this flying off the merchandise table.